When you next take a book to a charity shop, there’s a chance that it might end up as a work of art. Jukhee Kwon takes her inspiration from books that have been abandoned by their owner. When she sees an abandoned book, with its closed cover, she wants to open it, to free its potential. 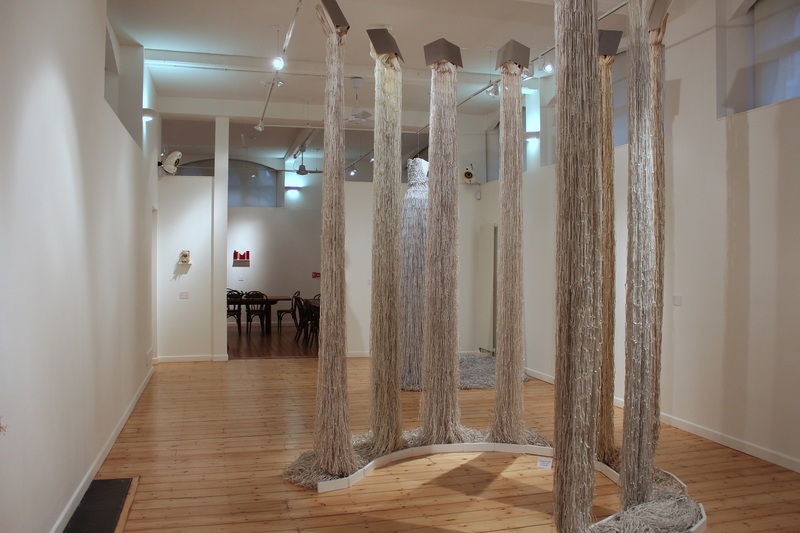 Kwon sees an object which has life, and which needs to be transformed and given new meaning. “A book is a very personal item” she explains. “You leave your fingerprints on it, you leave your notes on its pages.” When she picks up a book that has belonged to someone else, she feels the energy of the person who used to own it. The book speaks to her: “please free me” it seems to say. “It’s freedom and excitement for me, trying to express what has been hidden inside the book’s closed covers. The book has its own story, its own energy.” Taking a sharp knife, she meticulously cuts the pages line by line, leaving uncut a small amount of paper at the end of each other line. Once the page is fully cut, the resulting strip of paper concertinas out. The page of a meaty encyclopaedia can produce a strip of paper of up to 11 metres long. The spine of the book acts like the root of a tree, from which the strips of paper cascade downwards to the floor. But once the paper falls to the floor it creates its own root-like structure on the ground. At her exhibition in October Gallery you can see numerous examples of this. It is so tempting to brush your hands against the work, to see what they feel like, to separate out the individual strands, as you might with Christmas decorations which have been stored since last year. The exhibition is a mixture of the tantalising – because you are constantly tempted in this way – and the extremely restful. You want to walk around, and into, the sculptures, and to view them from every conceivable angle. Up close, you want to read the words on the page that has been cut to shreds; and of course you want to stand back an enjoy the shapes and the humour: a tap from which the paper chains are cascading, or a mask which is spewing out a torrent of cut paper. Jukhee Kwon: Vita, 2013. Paper (1 book), 15 x 30 x 20 cm. 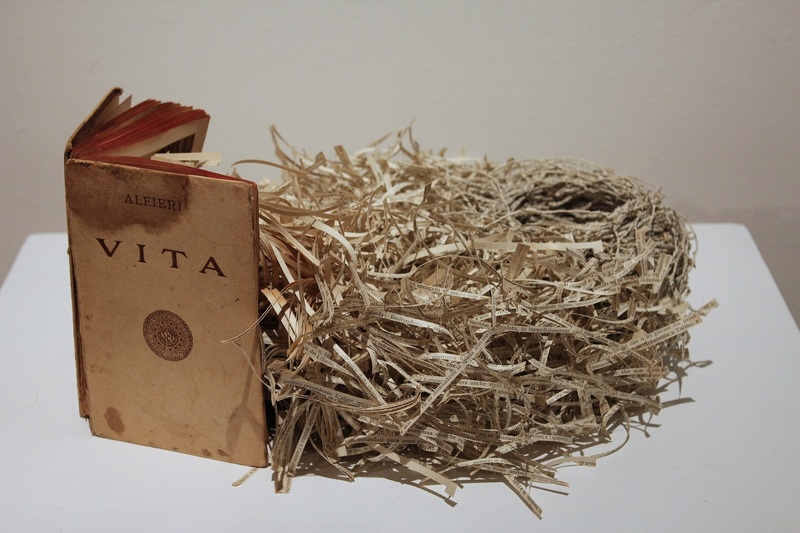 This idea is particularly evident in her work Vita: she discovered a stained and battered book of that name in a second hand shop in Italy, and transformed it into a bird’s nest, in which the fledglings of the next generation of birds are given life and then nurtured. The two large installations in the main gallery space complement each other. Redemption consists of 8 books which are hung from the ceiling to form a temple-like structure with 8 pillars. The installation invites you to enter it, and the strong vertical lines give the work a masculine energy. Next to it is the Wedding Dress, made of two books, a nurturing, protective structure which makes you want to hide inside the skirts. The male and the female are combined in a smaller work on the side wall: Libro Libero, made of a single book with some additional paper scrolls. The shredded pages cascade downwards from the remaining husk of the book, and are cradled by a nurturing basket of scrolls. The second room, which also houses a cafe, hosts some installations which use found objects – a tap, an old telephone, a ewer – to create fun sculptures. The exhibition is beautifully lit, and so appealing that you will want to pay it more than one visit. It’s also rather fun to photograph. 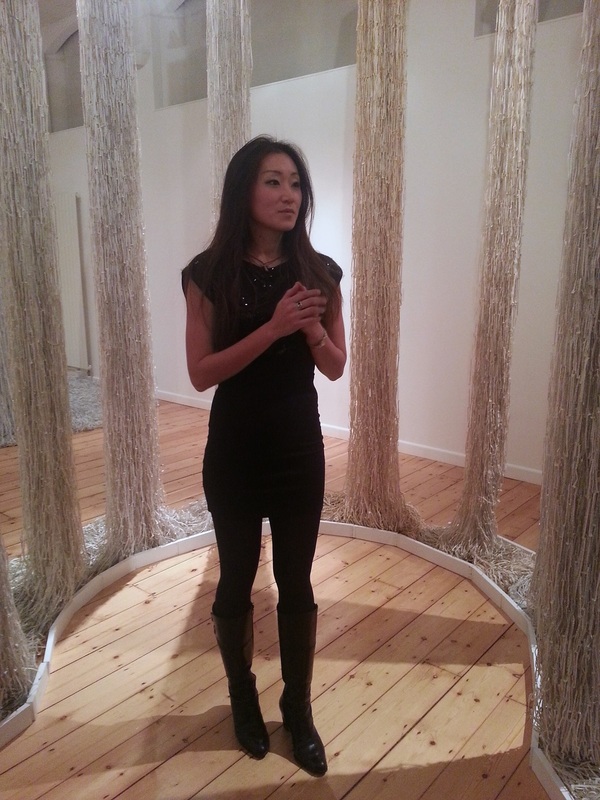 Jukhee Kwon’s exhibition is at October Gallery (24 Old Gloucester Street, London WC1N 3AL – Holborn Tube) until 1 February 2014. Opening hours Tues-Sat 12:30 – 5:30 or by appointment. All photos in this post are by LKL, courtesy of the artist and the gallery. Click one to launch a slideshow. 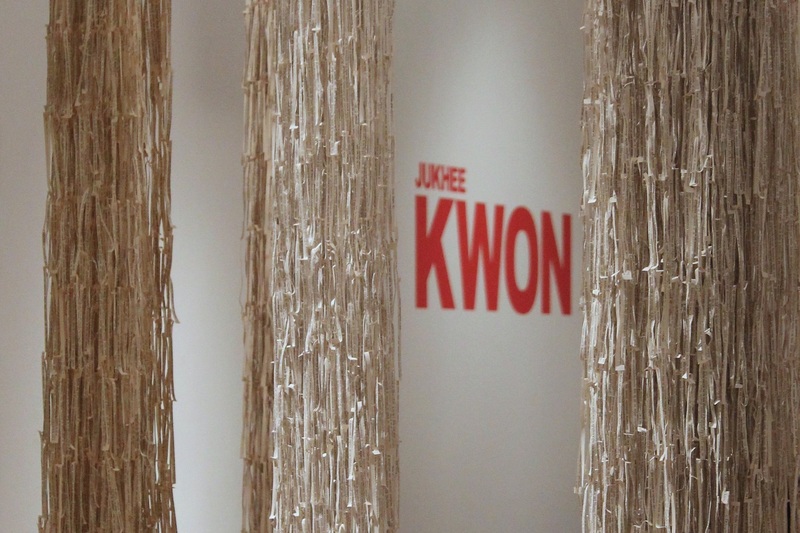 Foreground: Jukhee Kwon: Redemption, 2013. 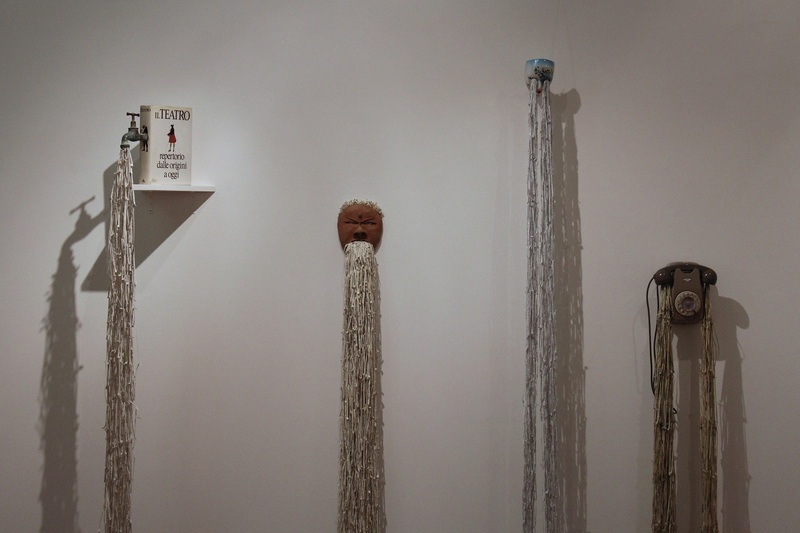 Paper (8 books), 450 x 125 x 125 cm. Jukhee Kwon: The Wedding Dress, 2013. Paper (2 books), 350 x 200 cm. Jukhee Kwon: Libro Libero, 2013. Paper (one book) and paper scrolls, 140 x 100 cm. Jukhee Kwon: Fluxus (Tap), 2013. Paper and found objects. Jukhee Kwon: Fluxus (Porcelain_Mask), 2013. Paper and found objects. Jukhee Kwon: Fluxus (Telephone), 2013. Paper and found objects.